The Spring Bloom 5K & Family Fun Day is right around the corner on Saturday, March 23! Please consider supporting our Lovinggood Foundation and come take part in our 5K Walk/Run. 100% of proceeds go directly towards transforming our current media center into a 21st Century Learning Commons. We are so close! That same day we will also be offering the Scholastic Book Fair, a Community Recycling event as well as a family fun zone, food and drinks! Show your support and come visit with us! Or click on any of the options below to show your support! VISION TO LEARN…Free vision screenings over Spring Break! Students, parents and community members…our book fair is here and ready! It will be open daily from 8:15-4:00 Monday thru Friday as well as on Saturday during our Spring Bloom 5K day from 8:00-12:00! Check out the amazing book trailer videos!! Want to allow your student to make purchases without sending in actual cash? 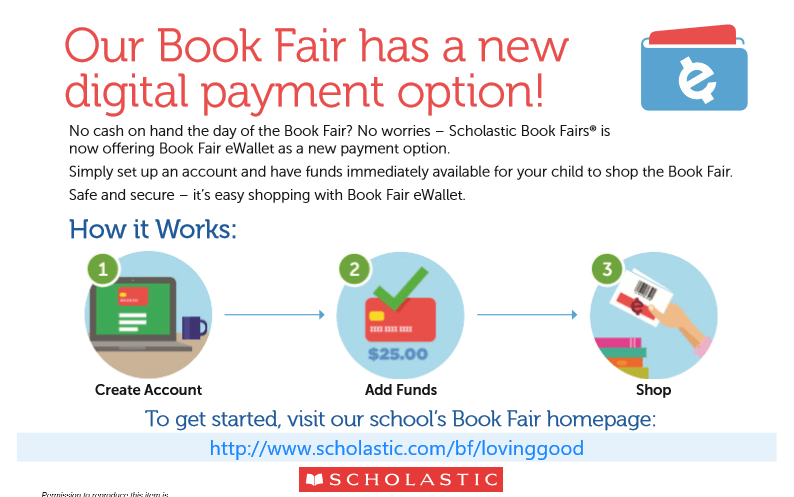 Set up an e-wallet by visiting our book fair homepage linked above! Thank you so much to all the parents and students who supported our LMS Fall Scholastic Book Fair! We set a new school record in sales and are so excited to order new technology (Sphero robots!) for the LLC Maker Space room. 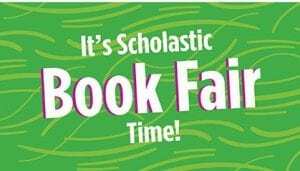 We can’t wait until our next book fair in March! Congratulations to Logan P. for winning the brand new iPad mini and to Mrs. Julkes for winning the dinner & movie prize pack! Parents, you can setup an eWALLET for your child so you don’t need to send cash/credit with them to school! (video clip below) Too busy to come by but want to surprise your child or grandchild with a gift? Order items online for ALL AGES starting now through Oct. 20! Click HERE to shop online OR to setup an eWALLET!! 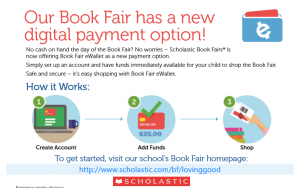 Please support LMS and foster your child’s love of reading through our Scholastic Book Fair! Volunteers are welcome! Please email me if you’d like to help out during school hours anytime from 8:30-1:30! Having trouble getting your device up and running while at school? Here are the step by step instructions to help you do so. More information and tips for troubleshooting can be found on the Instructional Technology website found HERE. The Library Learning Commons will be open for checkout starting Monday during homeroom! Please report directly to homeroom and get a lanyard pass from your teacher. 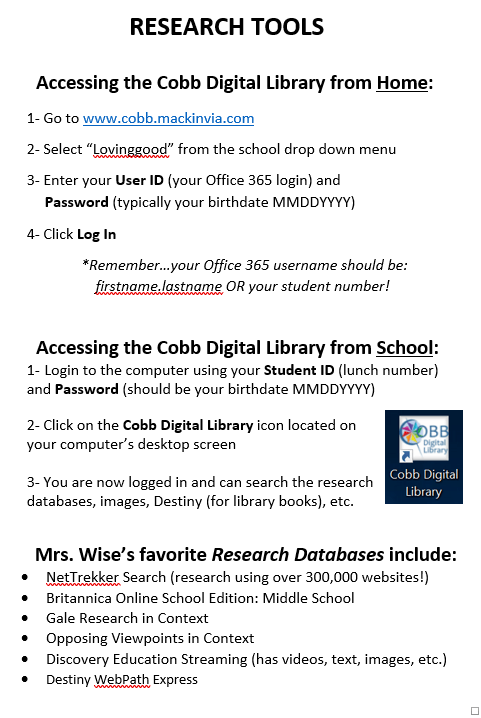 Upon entering the LLC, please visit the “sign in” station on your left by Mrs. Westover’s desk. Type in your student ID and reason for visit on a laptop. There will be three lines available to sign in. Students may check out up to 3 books at a time for up to 3 weeks. Students can view book due dates in Destiny or stop by and login in the LLC. Use the link above to access the bevy of online resources available to you as a Lovinggood Middle School student. You will need your user ID & password (O365 credentials) in order to gain access to these resources. 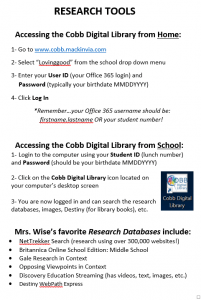 Use the link above to access the Lovinggood Middle School Destiny Library Catalog. At home, you will need your user ID & password (Office 365 credentials) in order to gain access to these resources.